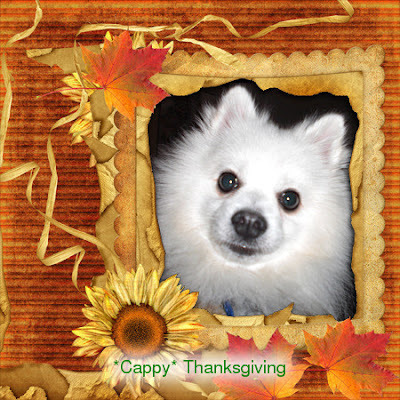 Hi ~~ I'm Cappy the Eskie,a miniature American Eskimo dog living in Mission Viejo, California along with my brother Oliver, a ruby Cavalier. The leftovers beckoned ~~ the dark meat and white. I fought the temptation with all of my might. the thought of a snack became an infatuation. peas and carrots, beans and tomatoes. I felt myself swelling, so plump and so round. ‘til all of a sudden, I rose off the ground. with a mouthful of pudding and a paw full of pie. Hope your Thanksgiving dinner stays off of your thighs.